Confessionally Yours by Jhoomur Bose. Publication : July 15th 2012 by Penguin Books India (Penguin Metro Reads). I’m thrilled to have Jhoomur Bose, a fellow blogger, journalist and a debut author, here today. Her novel, Confessionally Yours, hits the stores in a few days. Thanks so much for taking the time out to answer my questions Jhoomur. How does it feel to go from being a journalist and blogging to have your first novel published? Quite exhilarating and nerve-wracking at the same time; I’m quickly learning patience! As a blogger and as a journalist, you’re so used to getting instant feedback on what you write; it’s different with a book. The wait is killing but also perversely fun. 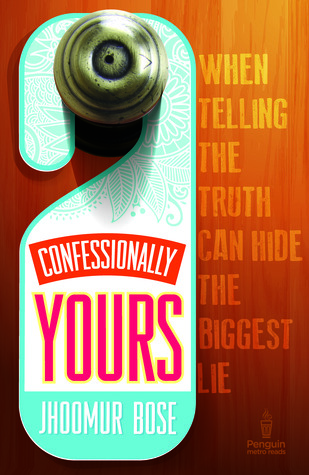 Confessionally Yours isn’t your typical chick lit novel, how did you get the idea? The idea was born out of the stories many readers and friends shared with me through comments on my blog, emails and over cups of coffee. What I realised was that no matter where you put the Indian woman – from New Delhi to Newark, Bhatinda to Ballarat – their stories don’t seem to change. If one woman is trying to single-handedly salvage an arranged marriage, another is living through unreasonable demands of a love marriage, or in-laws who are intent on interfering; yet another woman is confused if she wants marriage or if it’s the independent life for her and what that independence might mean… I wanted to write a story about the women I know, women like you and me. The protagonist, Polly, can you tell us a bit about her personality? Are any of your characters or incidents in your novel based on real life people/experiences? Real life experiences rather than real life people really. For instance, who hasn’t experienced bad office coffee? Could you name a few authors or books that inspire you? Inspiration has come from books and movies really, I always respond to stories that instantly “get” me. Fantasy author Sara Douglass (deceased), Terry Pratchett, Chuck Palahniuk, Nora Roberts (romance), Charlaine Harris, Kate Atkinson are few authors I really enjoy. What’s your favorite quote of all time? “Grab them by their balls and their hearts and minds will follow.” There is some confusion about who really said it originally, but the most popular theory is that it’s attributed to a General James Hollingsworth, the commanding officer of the 1st Infantry Division in Vietnam. If you met Polly before all the drama and you could give her one advice, what would it be? I’d tell her that she’s intelligent, beautiful and capable and that she does not have to settle for just any man. In fact I’d tell her to focus on her work and let life and love happen to her. I know it’s a bit soon, but do you have any plans for another novel? Thanks so much again Jhoomur! Giveaway ends on August 20th, 2012. 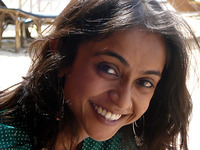 Jhoomur Bose is a former journalist, blogger and full-time mother. She has written for various Indian magazines, newspapers and websites and currently lives in Melbourne, Australia. She writes about stuff that happens and stuff she wishes would happen at http://twistingthetail.blogspot.com. I like when the female protagonist is strong and brave and can stand up for herself. I like strong female protagonists, like Tris from Divergent. Someone who is not dependent on others to protect her. I like a female protagonist who is strong and smart.Also,a female who knows her mind and knows what she wants.I don't like it when they keep changing their mind.Quiet strength,confidence and independent heroines are my favorite. Someone's who brainy and brawny.